It’s no secret that email is still the most effective communication channel to reach your customers, engage your audience, and drive conversions. At MailChimp, we’re always looking for new ways to energize our email newsletters with fresh perspectives that keep our users excited about our products This can sometimes be a challenge, since we’ve been in email marketing since 2001. But we’ve learned a lot in that time – like how beautifully designed newsletters can really make you stand out from the competition. When I talk to customers that are in need of inspiration on how to create an amazing email newsletter, I point them toward the resources I use, myself. In my guest appearance on Tara Gentile’s recent Bootcamp on CreativeLive, Build a Stand-Out Business, I take a deep dive into how we’re seeing some of the most creative brands in the world position their businesses for success. You can join the class and watch here. 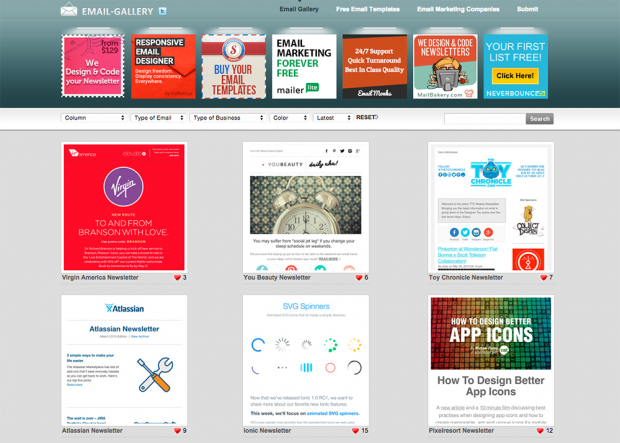 ReallyGoodEmails is a great collection of email design and email marketing insights. The site itself has a phenomenal design aesthetic and features the best emails they’ve seen from brands around the world. You’ll find examples from FourSquare, Basecamp, HuckBerry, Twitter, and more. The emails are even organized by type, so you can browse the most effective emails in various categories ranging from newsletters to engagement emails, onboarding messages, and ecommerce templates. CreativeMornings’ Out of the Ordinary Emails features extraordinary email newsletters about creative obsessions. Here you’ll find some creative examples of emails that’ll leave a lasting impression. My favorite is the handwritten newsletter from ThinkClearly. When you’re crafting an email, it’s important to know who you’re speaking to and how to best reach them. For example, you probably wouldn’t want to send a text-only email to your audience of graphic designers. Email Gallery is unique in that it allows you to filter by the type of business or industry that you’d like to view email styles for. This will allow you to see some of the more effective designs and communication styles for any industry you’re trying to communicate with. Over at The MailChimp Inspiration Page, we’ve selected some of the most beautiful newsletters sent by our own users. 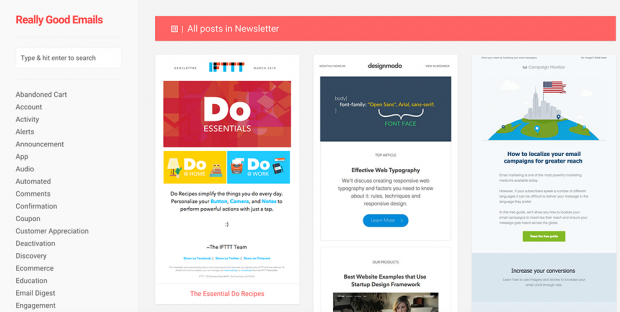 Some of our favorites are from Best Recipes, which will make your mouth water with delicious imagery, and Product Hunt, which will wow you with their brilliantly simple, mobile-first daily newsletters. Feeling inspired to send your own great newsletters? 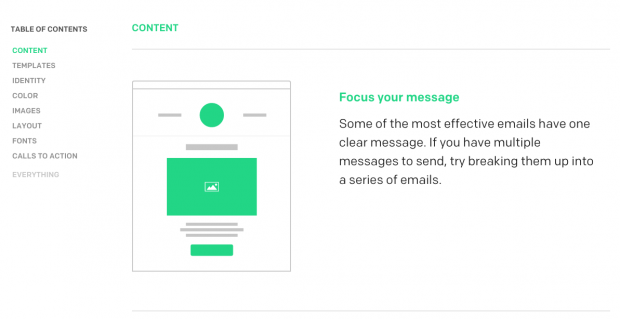 Check out our free Email Design Guide and get our hand-picked tips on how to create the email newsletter that’ll perform best for your audience. 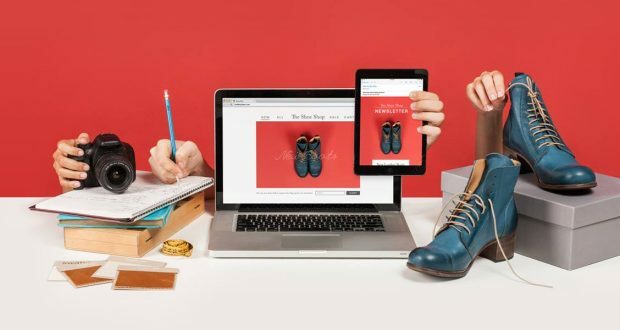 Whether you’re embarking on your first email newsletter design journey or you’re looking to give your brand a communications facelift, these resources will get you on the right track to achieving your goals of engaging customers and delivering value. Think carefully about how you communicate to your customers, and always seek to provide unique value to them each time you deliver an email. 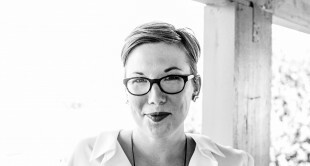 In my guest appearance on Tara Gentile’s Build a Stand-Out Business Bootcamp, I go into much more depth on how to design effective email newsletters and create meaningful content for your audience. We’d love to see you in there!